Principal component analysis (PCA)  is a classical statistical tool to analyze multidimensional datasets by determining the dominant axes according to a maximum variance subspace principle. As the underlying mathematical machinery can be shown to be equivalent to an eigenanalysis of the covariance matrix, PCA axes are usually also named eigenmodes. In cases where outliers can be present in the dataset, there exist robust extensions to PCA, which are less sensitive to wrong or imperfect data samples. In our application, we performed a PCA-based statistical decomposition of FMD curves and explored the use of the projections on the corresponding eigen-modes (mode coefficients) as potential surrogate indexes of classical AFMDc. To our purpose we will use a robust version of PCA known as ROBPCA  to avoid problems derived from potentially imprecise dilation curves in our dataset. Figure 5.11: Definition of the segment of analysis for principal component analysis (PCA). (a) The original curve with indication of the instant of cuff release (first discontinuous vertical line), and start- (ncuff + 15 sec) and end-points (206 sec later) for PCA (second and third disconstinuous vertical lines); horizontal solid lines indicate the maximum flow-mediated dilation (FMD) and basal FMD levels used for the computation of classical AFMDc. Horizontal solid lines indicate the maximum FMD (a 0max) and basal FMD levels (a 0basai), which are relative to a reference frame (a 0r). (b) A zoom into the segment that will undergo PCA. 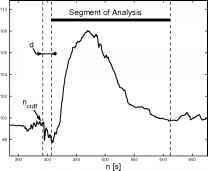 The segment of analysis is indicated with a thick solid line. 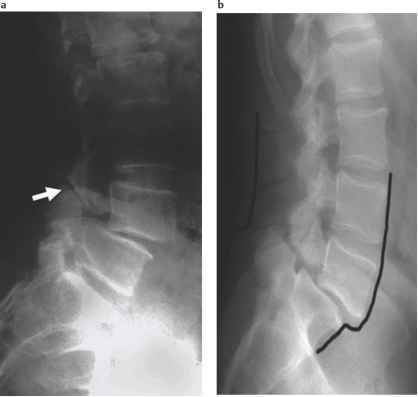 To be more specific, let CT (n) be an FMD curve (Fig. 5.11(a)). In order to analyze only FMD effects, a segment of this curve, C(n), was selected for PCA (Fig. 5.11(b)). This segment is defined to have a duration of D = 206 sec starting d = 15 sec after the release of the cuff pressure. In this way, all segments are synchronized with the FMD onset and have the same duration, which in our acquisition protocol is enough to reach the post-FMD basal level in all subjects without overlapping with the NMD test. We disregard the first 15 sec since that portion of the curve is mostly noisy due to motion artifacts. AFMDc values were also measured by visually selecting the maximal and basal FMD levels. Since the whole curve is relative to the diameter of the reference frame, AFMDc can be calculated directly from this plot. By considering the C(n) curve as a D-dimensional vector, c, ROBPCA will be applied to the vector set (Ci/Ci(no)}, of normalized relative values, where i = 1 ...n is the subject index. In our experience, it is convenient to compute the EigenFMD modes with respect to a frame that represents the basal level, hence the division by Ci(no) (cf. next section). 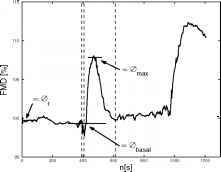 This renormalization corrects for small fluctuations in the baseline due to patient movements in the maneuver of cuff deflation, which themselves can introduce artifactual variation into the statistical analysis. This experiment contains n = 161 subjects, whose curves did not have any apparent artifacts in the FMD segment. 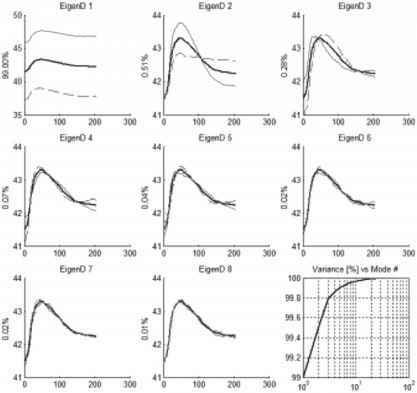 Figure 5.12 shows the resulting eigenmodes of the relative FMD curves, which will be referred as EigenFMD modes in the sequel. Figure 5.12: Representation of the variation explained by the first eight eigenFMD modes. The average flow-mediated dilation (FMD) curve, and the curves resulting of adding/subtracting the corresponding EigenFMD mode of variation to the mean, weighted by one standard deviation, are plotted in bold line and in thin solid/dashed lines, respectively. The y-axis label of each EigenFMD plot indicates the percentage of variance explained by the corresponding EigenFMD. The lower-right plot shows the accumulated percentage of variance versus the number of EigenFMD modes taken into account. EigenFMD modes were computed using the ROBPCA method. Figure 5.13: Representation of the variation explained by the first eight EigenD modes. The average diameter curve, and the curves resulting of adding/subtracting the corresponding EigenD mode of variation to the mean, weighted by one standard deviation, are plotted in bold line and in thin solid/dashed lines, respectively. The y-axis label of each EigenD plot indicates the percentage of variance explained by the corresponding eigenmode. The lower-right plot shows the accumulated percentage of variance versus the number of EigenD modes taken into account. EigenD modes were computed using the ROBPCA method . modes to emphasize that they correspond to absolute diameter curves. 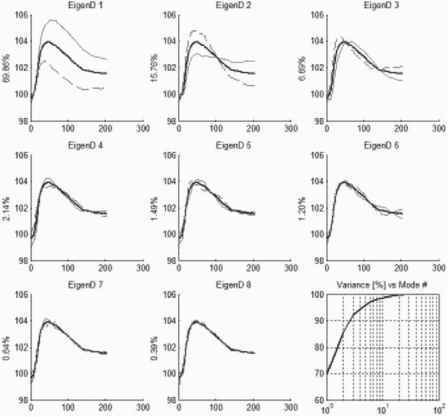 One can observe the fact that the first EigenD mode, which basically represents variations in average vessel diameter, accounts for most of the variability in the dataset and can be regarded as a robust global measure of vessel width. Note that EigenFMD and EigenD modes are similar except for the first mode and the variance attributed to each mode.